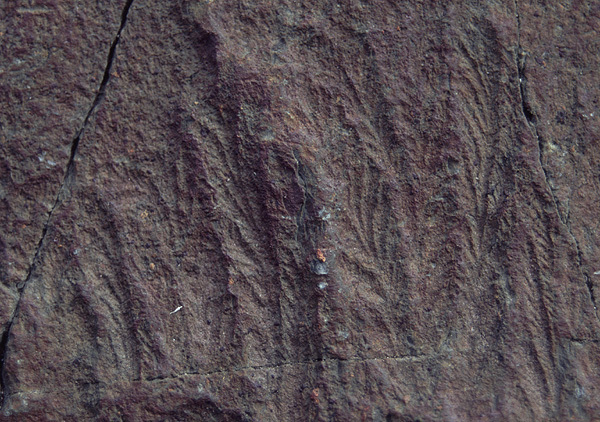 The slabs that Misra saw contained numerous imprints of soft-bodied organisms, some of of which resembled those found at other late Precambrian sites, such as the White Sea coast of Russia and the Ediacara Hills of southern Australia. Most, however, had not been found anywhere else in the world, and defied identification with any known living organism. Typical of the Mistaken Point biota were large frondlike, leafy forms  some with stalks, others with a bush-like or cabbage-like appearance, others with a branching, tree-like or network-like shapes, and still others spindle-shaped, long and pointed at both ends. Large, lumpy disc-shaped fossils were also found to be abundant. 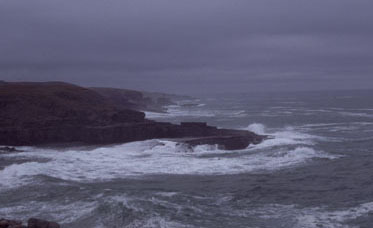 Today, Mistaken Point is known world-wide for its remarkably preserved fossils, unique in several ways. The Mistaken Point fossils were preserved by being blanketed with layers of fine volcanic ash. Volcanic ash is ideal for radiometric dating, and this has enabled the Mistaken Point fossils to be dated at approximately 565 million years old  making them the oldest complex "Ediacara-type" fossils that have been accurately dated at this time. The volcanic ash has preserved large numbers of fossils on individual bedding planes, creating "snapshots" of what the sea floor looked like. This has allowed scientists to study the ecology of these organisms in ways that are not possible anywhere else. Study of the surrounding sedimentary rocks has shown that the Mistaken Point organisms lived in a deep-water environment, far below the depth to which sunlight or surface waves could have reached. This contrasts strongly with most "Ediacaran" fossil assemblages, which were laid down in relatively shallow water. Finally, the affinities of most of the fossils remain obscure. While some of the Newfoundland fossils are similar or identical to others that have been described from Charnwood Forest in England (Boynton and Ford 1995), others have not yet received scientific names. Their evolutionary relationships and modes of life are still poorly understood. While a few of these fossils at least outwardly resemble living animals, notably the Pennatulacea or "sea pens," most appear radically different from any known living animal. 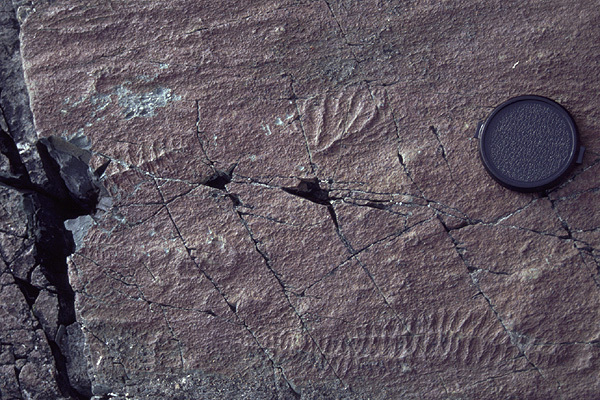 The Mistaken Point fossils have inspired a good deal of controversy, with some scientists assigning them to a completely separate kingdom of multicellular life (e.g., Seilacher 1992, 1994). In June of 2001, a group of scientists visited Mistaken Point and nearby sites on a field trip under the auspices of the Geological Asociation of Canada, led by Dr. Guy Narbonne and Dr. Robert Dalrymple of Queen's University and Dr. Jim Gehling of the South Australian Museum. UCMP alumnus Ben Waggoner, author of this web page, participated in the field trip and created this exhibit. You may click on any of the smaller images to bring up a larger, high-quality version. Mistaken Point can be visited by those willing to hike a bit in a rather remote and occasionally hazardous area of Newfoundland. However, the area is an ecological reserve and is protected, both by Canadian law and by the people of the nearby towns, who are committed to preserving their paleontological heritage. 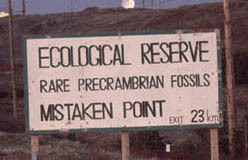 Collecting fossils or making replicas in the Mistaken Point reserve is strictly prohibited without a permit. 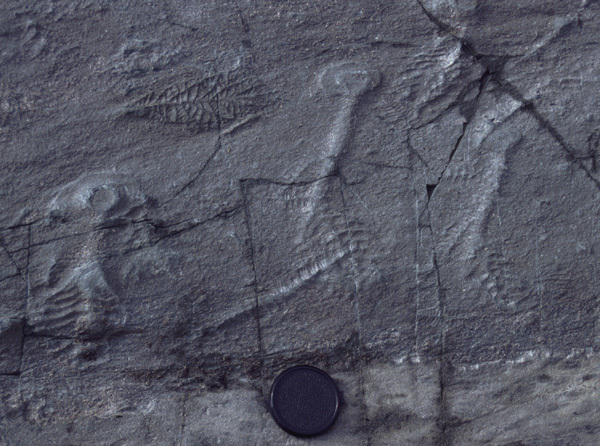 By far the most common fossils at Mistaken Point are the "spindles"  at the best- exposed site, over one thousand "spindles" are preserved on one surface. Despite their abundance, the "spindles" have not yet been given an official scientific name, and they have been found nowhere else in the world but southern Newfoundland. The largest "spindles" are about a foot long (30 cm), but most are smaller; small "spindles" have virtually the same shape as larger ones. Running down the middle of each "spindle" is a sediment ridge, but this probably represents a relatively weak point in the fossil, into which the underlying sediment was forced upwards as the organism was buried and compacted. Coming from both sides of the midline are fan-shaped bundles of "ribs," each of which is itself further subdivided. These "bundles" do not appear to have been separate leafy structures, but instead were completely connected to the rest of the whole organism, something like the patternings on a quilt. "Spindles" are sometimes found bent, twisted, or even broken, but on the whole appear to have been fairly tough and resistant in life. At the top left is a well-preserved "spindle;" at the bottom is a close-up of another "spindle," showing the fan-shaped bundled structure of the fossil. 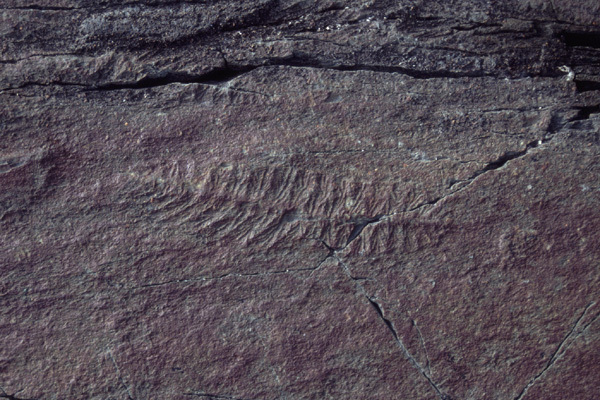 Frondlike fossils are also common at Mistaken Point. These have a bulb-shaped or disc-shaped "holdfast" which was attached to the sea floor, and a leaf-shaped main body that probably was held up in the water column. At left, the top two are specimens of Charniodiscus: the holdfasts and stalks are very prominent. (A third specimen is visible on the larger image, along with some "spindles".) The volcanic ash that buried these specimens flattened all of them in the same direction; this explains why the stalks of all of them point in the same direction. Another specimen of what is probably Charniodiscus is depicted in the center; note that the "frond" on this specimen extends into a long, pointed tip. At the bottom is a well-preserved specimen of a frondlike fossil with a small holdfast (on the left) but no stalk. This specimen has been figured before, but not named (Seilacher 1992) and is currently thought to represent a new species of the genus Charnia. 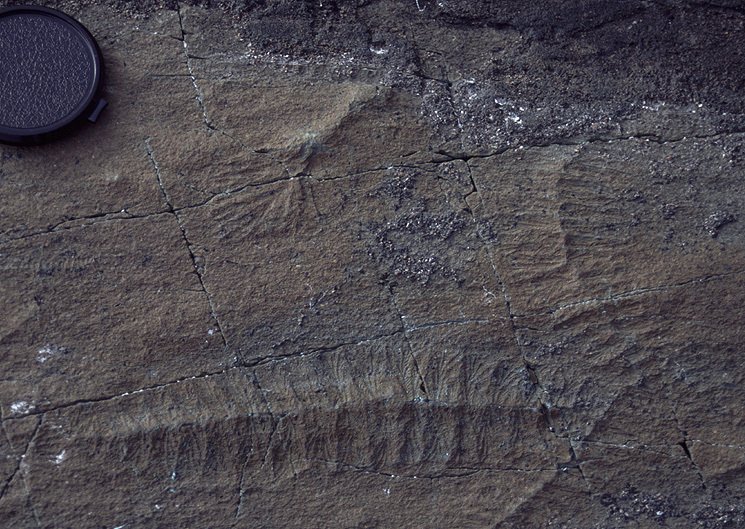 Both Charnia and Charniodiscus were first described from the late Precambrian rocks of Charnwood Forest, England, but have since been found at several other localities worldwide, notably the White Sea and the Ediacara Hills. This specimen, which is located very close to the Charniodiscus figured above left, is not oriented parallel to the current. This may reflect the fact that in life this organism lay nearly flat on the sediment, rather than sticking up into the water column. 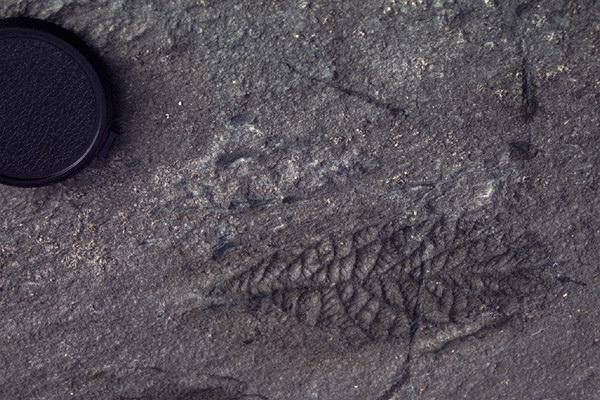 At left top is a "bush" form  very similar and probably identical to a fossil named Bradgatia from the late Precambrian rocks of Charnwood Forest, England (Boynton and Ford 1995). In the middle you can see an unnamed fossil with a stalk and holdfast like Charniodiscus, but with an unusual feathery shape. At the bottom is another distinctive Newfoundland form  a disc-shaped fossil divided into irregular lobes. This form is also very much like a Charnwood Forest fossil named Ivesia. All three of these forms are closely associated with "spindles;" in fact the specimen of Ivesia shown here appears to have been lying on top of a "spindle" as it was buried. Anderson, M.M., and S. Conway Morris. 1982. A review, with descriptions of four unusual forms, of the soft-bodied fauna of the Conception and St. John's Groups (Late Precambrian), Avalon Peninsula, Newfoundland. Proceedings of the Third North American Paleontological Convention 1:18. Anderson, M.M., and S.B. Misra. 1968. 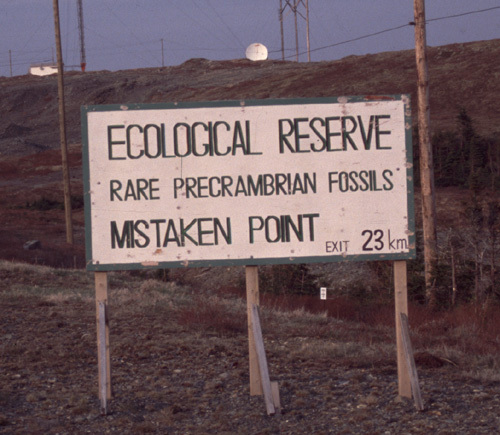 Fossils found in pre-Cambrian Conception Group of southeastern Newfoundland. Nature 220:680681. Boynton, H.W., and T.D. Ford. 1995. 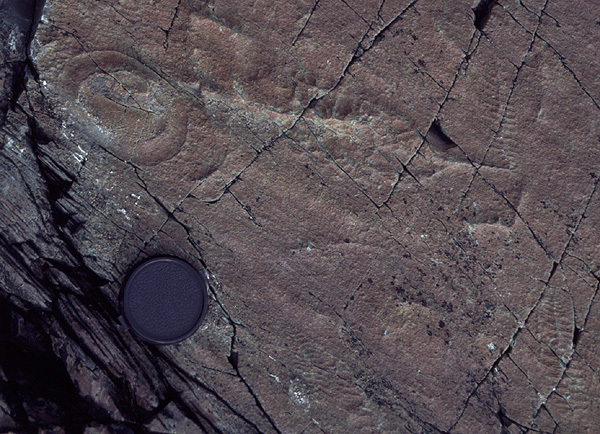 Ediacaran fossils from the Precambrian (Charnian Supergroup) of Charnwood Forest, Leicestershire, England. Mercian Geologist 13:165182. Misra, S.B. 1969. Late Precambrian(?) fossils from southeastern Newfoundland. Geological Society of America Bulletin 80:21332140. Misra, S.B. 1971. Stratigraphy and depositional history of late Precambrian coelenterate-bearing rocks, southeastern Newfoundland. Geological Society of America Bulletin 82:979988. Seilacher, A. 1992. Vendobionta and Psammocorallia: lost constructions of Precambrian evolution. Journal of the Geological Society, London 149:607613. Seilacher, A. 1994. 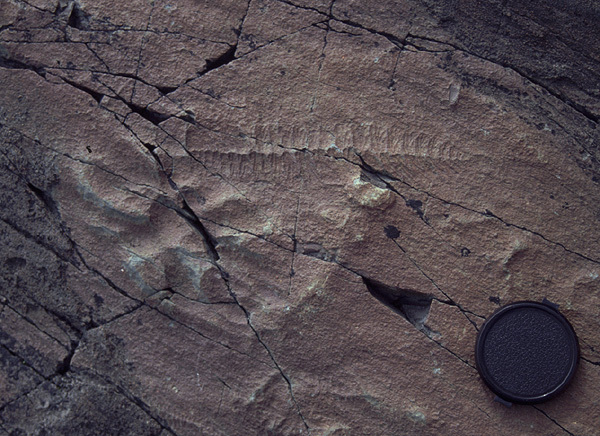 Early life on Earth: Late Proterozoic fossils and the Cambrian explosion. Pp. 389400 in S. Bengtson (ed.). Early Life on Earth. Nobel Symposium 84. Columbia University Press, New York. Waggoner, B.M. 1999. Biogeographic analyses of the Ediacara biota: a conflict with paleotectonic reconstructions. Paleobiology 25(4): 440-458. "The Mistaken Point Fossil Assemblage" webpage is part of the online exhibit, The Dawn of Animal Life, at the Miller Museum of Geology, Queen's University, Kingston, Ontario, Canada. You may also visit Mistaken Point Fauna: The Discovery for more information on S.B. Misra and his work in this locality.